His Royal Highness Emir Muhammadu Sanusi II was born into the Fulani Torodbe (Sullubawa) clan of Kano, Nigeria and was crowned on the 8th of June 2014 as the Emir of Kano, succeeding his late great-uncle Dr. Ado Bayero. 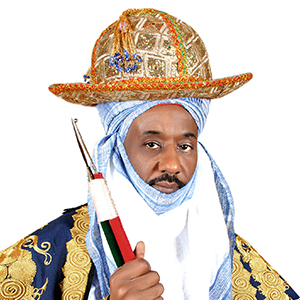 HRH Sanusi was a successful banker and was a former Governor of the Central Bank of Nigeria. He was a career banker and ranking Fulani nobleman. The global financial intelliegence magazine, The Banker, published by the Financial Times, has conferred on Sanusi two awards, the global award for Central Bank Governor of the Year, as well as for Central Bank Governor of the Year for Africa for 2011. The TIME magazine also listed Sanusi in its TIMES 100 list of most influential people of 2011. He was highly respected before joining the central bank, having served as the chief executive of First Bank FIRSTBA.LG. Prior to that, he served as chief risk officer at First Bank and at United Bank for Africa (UBA), two of the country’s largest lenders. HRH Sanusi won an international reputation as a reformer following the bail-out of nine lenders just weeks after taking office at the helm of the central bank, a move which many bankers say saved the financial sector in sub-Saharan Africa’s second biggest economy from the brink of collapse. He sent shockwaves through the corporate establishment, sacking the chiefs of eight of the banks and felling pillars of Nigeria’s financial aristocracy who had long seen themselves as beyond the reach of the regulators in doing so. HRH Sanusi gained degrees in economics and Islamic law from Ahmadu Bello University in Zaria, northern Nigeria, where he also taught economics before going into banking in 1985. He has regularly spoken out about the need to fight corruption not only in the financial sector but in the political system in Nigeria, winning him as many enemies at home as he has friends in the international investment community.